Everyone knows my favorite holiday is Thanksgiving, but do you know what my second favorite holiday is? You might think Christmas for all of the fussing I do, but it is St. Patrick’s Day. St. Gertrude also has a feast day on the same day, and she is the patron Saint of cats and all those who love them. My mother’s maiden name is O’Donnell, so there is no denying I have Irish heritage. In fact, I connect more to my Irish and Little Shell Chippewa/Metis roots more than my German, Polish, Scotch, Dutch and English roots. Which means we celebrate St. Patrick’s Day American style and quietly. I never, ever consume alcohol on St. Patrick’s Day. I find it offensive that the holiday, which was never originally a drunk fest, has turned into an alcohol-soaked fete at the expense of one ethnic group that was consistently harassed and discriminated against for generations in America. So, we never drink on that day, it’s a Holy Day of Obligation. Because the Irish are so Catholic and there are a great number of them, the Pope always gives a dispensation to the Irish so they can consume meat on St. Patrick’s Day as the day falls during Lent. In Ireland, this means a special cut of bacon for the meat course. We can’t get that kind of meat here, so our Irish fore bearers used a cheap cut of meat from their Jewish neighbors in large cities-corned beef. It was inexpensive, readily available and can feed a crowd. My St. Patrick’s Day feast consisted of the Irish-American meal of corned beef, steamed cabbage with lots of butter and a little kosher salt and freshly ground black pepper, roasted red potatoes (the small ones), and Irish-American soda bread baked in my Grandma O’Donnell’s Ovenex bread loaf pan. I have to infuse family in a family holiday! Here is the recipe I use. It comes from a Herberger’s cookbook called Cooking For Your Style of Living and was submitted by Margaret Kavanaugh from East Gull Lake, Brainerd, Minnesota. Sift first 5 ingredients together. Stir in raisins. Combine eggs, buttermilk and shortening. Add liquid mixture to dry ingredients. Mix just until flour is moistened. Turn batter into a greased loaf pan. Bake at 350 degrees for approximately one hour. Remove bread from pan immediately. I found that the 1 3/4 cup of buttermilk was sufficient, but you may want to add more. Some people despise buttermilk and don’t have it on hand. I love buttermilk. But if you can’t stand it, for 2 cups of buttermilk, simply add 1 tablespoon plus one teaspoon of vinegar or lemon juice to 2 cups of milk, or 1 3/4 teaspoon of cream of tartar to 1 cup of milk to use as a substitute. 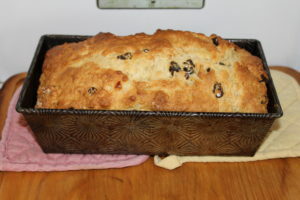 Irish-American soda bread in Grandma O’Donnell’s Ovenex bread loaf pan.